December 31, 2009 By John P.
2,500 Pushups – That is 50 pushups a day for 50 out of the 60 available days. Should help my arms, chest, back, and cardio. 1,000 Bicep Curls – Obviously, this is just for one thing! Cause the ladies love a good gun show! :-) I typically curl 30 pounds (per arm) X 30 reps, 3-4 days a week. If I achieve this, I will have curled 15 Tons per arm during the two months. 1,000 Squat Thrusts – This is an all around exercise which is especially great for the abs. 10 Miles on the Treadmill – Ok, this might not seem that agressive to you guys, but I sustained injuries in the Marine Corps and running is a little painful. But still, I want the cardio. 250 Pullups – I mounted a pullup bar in my house, and I intend to work these in for more upper body strength throughout the program. So, how about it? Do a little math and then let me know what you are committing to for the next 8 weeks! Squat thrusts kill me. It doesn’t help that I’m 280lbs. So, take that weight and put another hundred on the shoulders and you have yourself a guaranteed burnout. Also, a VERY simple exercise that will work nearly every muscle in your body: If your gym has “steps” put about 1 foot worth of steps down. Make a 50 foot runway with the steps in the middle. Next, take a curling bar and add say about 5 lbs per side. 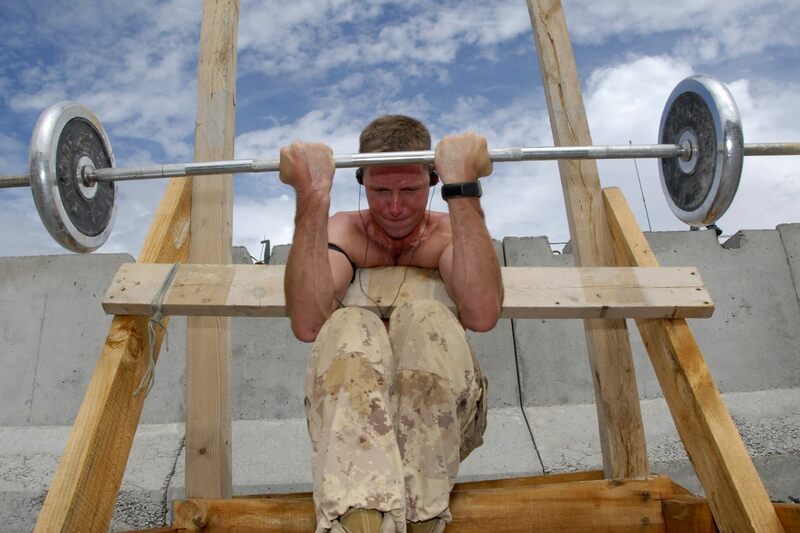 Hold the bar above your head as high as you can. Tighten the abs, and run up and down the runway stepping on the steps each direction. Crazy good full body workout. Just got my daughter married off and am leaving DFW to fly back home. Wanted to update everyone on my progress after the first 14 days of the health challenge. I’ve lost 5 pounds so far!